We were talking to bloggers and authors Lynn James and Emma Bradley about their new book Blogging Your Way To Riches for last week's Finance Fridays. Last September we had a look at the new £5 note that has been introduced. This was the first in a line of new notes and coins that will be issued by the Bank of England and Royal Mint in the next few years. Today we're going to look at what new coins and notes are going to introduced and how long you have to get rid of the old designs. £5 note – The new polymer design was introduced last September. Since then it has been plagued with controversy from the notes sticking together to it containing traces of tallow which is derived from animal fat. There's also been a 'Willy Wonker' style hunt for the rare and valuable notes that have been etched with a portrait of Jane Austen. Notes with special serial numbers such as AA and the 'Bond' style 007 have also been selling well amongst collectors. The old paper £5 note will cease to be legal tender from 5th May 2017 so make sure you check your old purses, wallets and bags for any old notes. They may be accepted by Post Offices and banks after this date but it is not guaranteed. If you find you can't exchange them locally you will need to take them to the Bank of England in London. Next new notes – A new polymer £10 note will be issued later this year. The £20 note is due to be replaced in 2020. The last time the £50 note was replaced was in 2011 and there are no plans by the Bank of England to change it. £1 coin – Since its introduction in 1983 the £1 coin has been the same shape, size and colour. There has been a number of different designs on the coins but they have all been kept in circulation and accepted as payment. The new 12 sided £1 will be issued on Tuesday 28th March 2017. Like the £2 coin it will be made of two different coloured metals. One of the main reasons for the change in design it that current shape is prone to counterfeiting – it is thought there is currently £45m worth of fake £1 coins in circulation. Between 28th May and 15th October 2017 both the round and 12 sided coin will be in 'co-circulation'. After 16th October 2017 the old £1 coin ceases to be legal tender. Retailers and businesses are under no obligation to accept the old round coin and they shouldn't give it out to their customers either. If you have the round coin you should be able to take it to a Post Office or your high street bank to be deposited. There has been reports of vending machines struggling to be converted to be able to accept the new £1 coin. A lot of vending machines still do not accept the new £5 note so when you use a car park with a cash payment machine it is worth checking the machine before you return otherwise you may have problems paying. Many supermarkets have already converted their trolleys to take both coins so you won't need to change your trolley token. 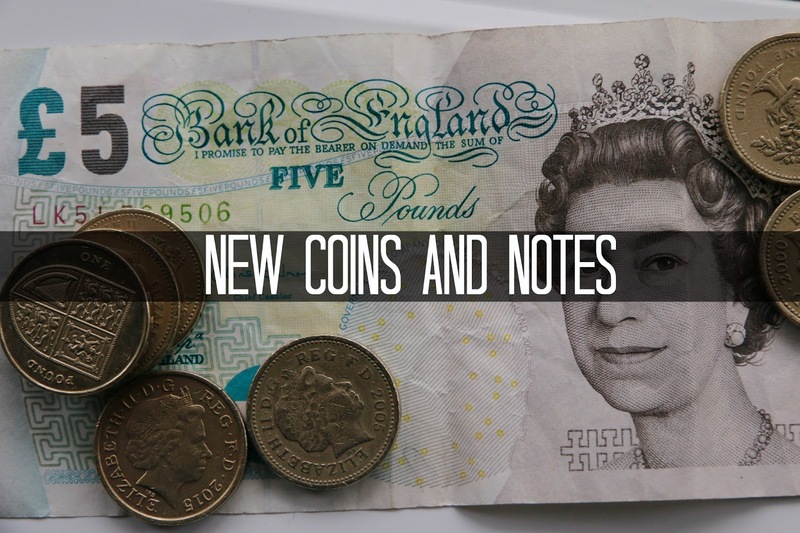 If you have started any money saving challenges this year and have £1 coins saved it may be worth taking them out now and swapping them for notes or paying them into a bank account. Have you still got any of the old £5 notes? What do you think of the new £1 coin? If you want to join in with this week's Finance Fridays then add your link to the linky below. Any post concerning financial matters is allowed. Full details here. It doesn't have to be published today as you have until 23.55 on Tuesday 24th January 2017 to join in. I like the new polymer £5 so I'm looking forward to seeing the £10! I didn't know that the new £1 coin was out so soon. I will have to make sure we get rid of all the £1 round coins as I have stashes of these in the car for parking and in the house in a moneybox! Thank you for the info - i like the new fiv pound notes as they are clean and feel tougher. I had no idea a new one pound coin was due though! I really don't like the new five pound notes, they feel like my kids toy money!